I had been looking at going to the Amalfi Coast in summertime but when a friend invited me to Naples in December 2016 I decided to go for Christmas week and I'm so glad I did. I've lived in the Middle East for such a long time and to spend Christmas in a country that really celebrates Christmas was just great! Naples really is a great base for exploring the Amalfi Coast as all the famous places such as Capri and Positano are easy to get to and take around an hour. Out of season is great too because you can decide the day before where you would like to go and where to stay as the hotels are not full and the prices are not sky high. So here is my story of what I got up to. My friend met me at the airport and we headed to the hotel Palazzo Decumani which is close to the San Gregorio Armeno, the street where they make and sell nativity sets. The hotel is lovely and modern and definitely recommend it as a base, it is in the busy streets with coffee and pizza shops along with tourist fare. These streets also have lots of interesting graffiti and the odd Banksy. There are also lots of interesting historical buildings amongst all the graffiti and the Purgatory Church was particularly eerie. It's just enjoyable to wander around and see what you come across. A Banksy which the local council have covered with a glass frame and plaque! Went to the Teatro Di San Carlo for the Christmas Big Band Jazz show. The Theatre is very ornate, a lovely historical building well worth a visit and the show was great. We didn't book tickets to go, literally decided on a whim whilst walking past that we wanted to go and we were lucky enough to get a seat. The next day we headed to Sorrento on the train from Naples. It only takes an hour but can get quite busy. On arrival at Sorrento we found our hotel Palazzo Jannuzzi Relais on the Piazza Tasso. 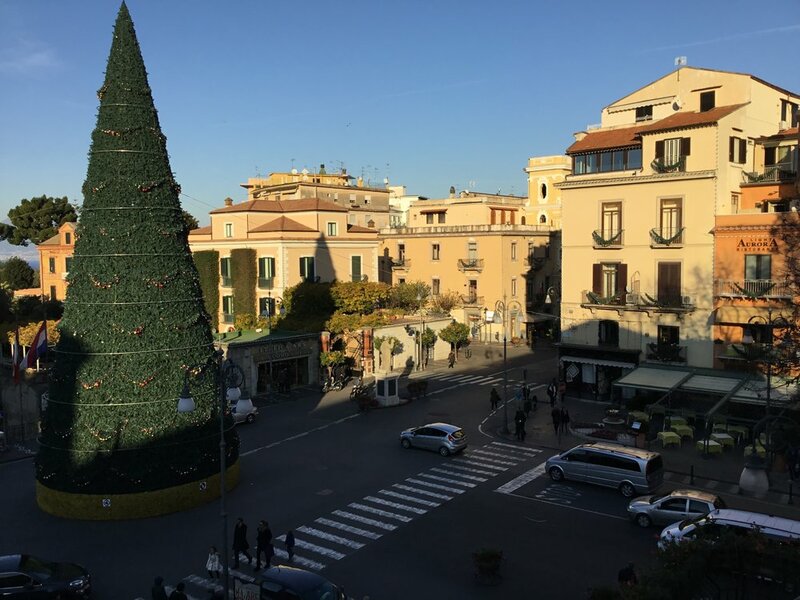 We had a lovely room with a balcony overlooking Piazza Tasso and there was a Christmas tree which every hour lit up and had different Christmas carols and songs. I absolutely loved this as it really got me in the Christmas spirit! Piazza Tasso is full of life, lots of people milling around, many restaurants and bars to pick from, we found a great cabaret next to our hotel which was great fun. Wandered down to the port and along the streets, it really is just lovely. 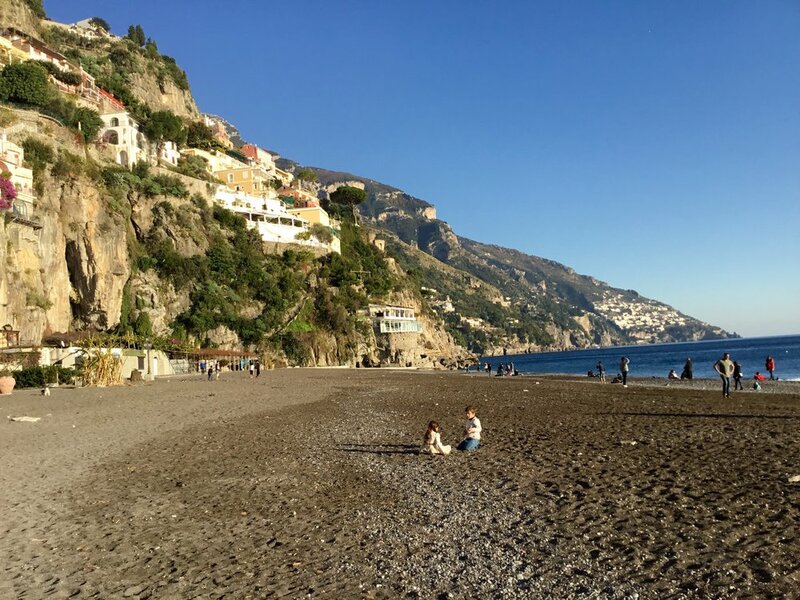 On Christmas Eve we decided to go to Positano for a day out from Sorrento. We just caught the bus as it was out of season and the road wasn't too busy. Got off the bus at the top of Positano as my friend felt unwell from the windy road. But this turned out to be a good idea as there are wonderful views and it is quite nice to wander down to the beach. It was a lovely sunny day and there seemed to be quite a lot of people around even though it was out of season and a lot of hotels were closed. Found the Hotel Ancora to be open and enjoyed a prosecco and a rest before heading back to Sorrento. Back in Sorrento the cafes and shops were closed but you could hear everyone having their Christmas Eve dinner with the scraping of plates and laughter. Found one hotel open in the evening for more prosecco and the singing tree serenaded us on our return to the hotel! Christmas Day we decided to head back to Naples on the train and went back to the Palazzo Decumani for a night. Walked to the end of the road from the hotel and found a great pizza place which was open and enjoyed a Christmas Day Naples pizza and beer! The next day I decided to head to the Promenade and booked the Royal Continental Hotel opposite the Castel Dell 'Ovo. This is a great location as the Promenade gets busy with local people walking their dogs, running and just enjoying a nice stroll in the fresh air. There are also lots of restaurants to choose from along the Promenade and also in the Castel Dell 'Ovo area. Lots of people come to this area for sunset, which if you are lucky is quite spectacular. Found a lovely Michelin starred restaurant called La Cantinella here, worth a visit. 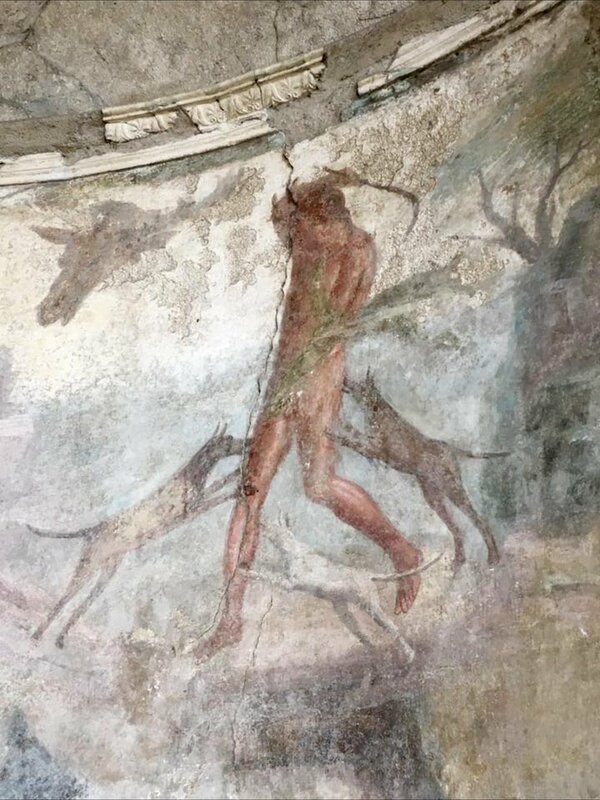 The next day I had booked a trip to Pompeii and was picked up outside my hotel for a half day tour. I love history and have a good imagination and the guide was quite descriptive and informative so I could really imagine what the city had been like. Of course the brothel pictures were amusing, there were lots of painted walls in the houses as well, very interesting. I managed to cover it all in a half day tour but if you wanted to take your time going for a full day would be good too. 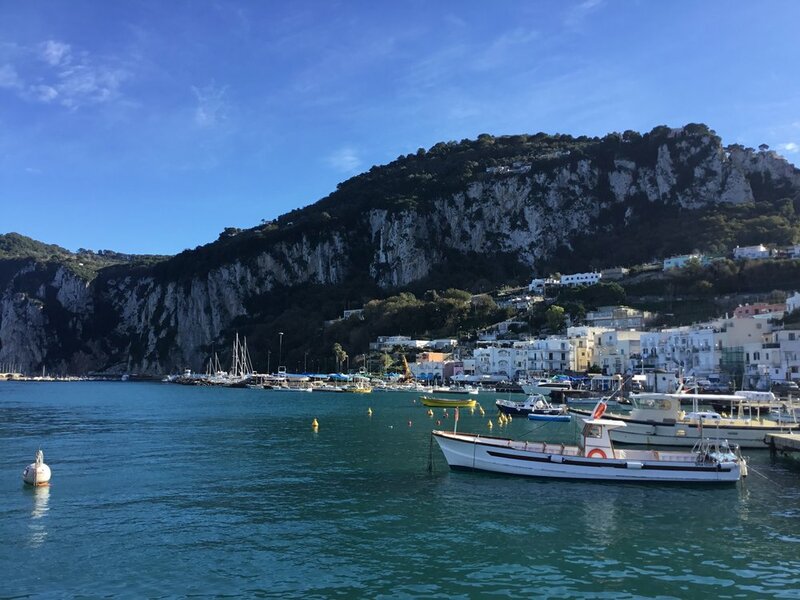 I found that from my hotel opposite the Castel Dell 'Ovo, it would only take around ten minutes to walk to Naples Port, so the following day I decided to do a day trip to Capri. You buy your tickets online and then pick them up at the Port. The trip took less than an hour and on arrival at Capri you can go to the Tourist Office in the Port and get a map and advice of what you could do in your timescale. I was advised that I had time to go to the Piazzetta, the Charterhouse of St Giacomo and see the Faraglioni from Augustus Gardens. Totally get why Capri is called the blue island, the views are just beautiful and blue! The views from Augustus Gardens are just lovely, definitely worth going there. Enjoyed lunch in the Piazzetta, noticed it was busy and to think that was low season, it must get extremely busy in high season. I did like Capri, would like to return and spend more time there and maybe go to Anacapri also. On the way back I had time to sit at a cafe at the Marina Grande whilst waiting for the ferry and that was pleasant too. 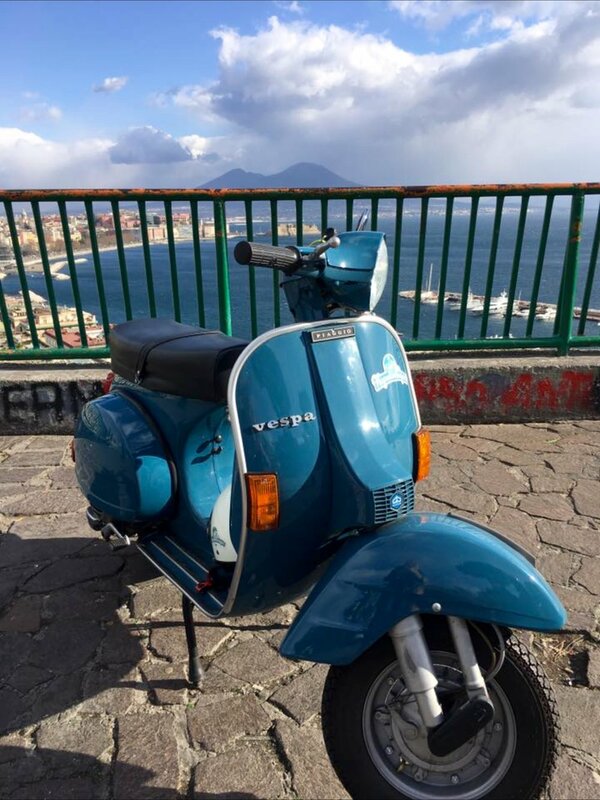 On my last day I decided to go on a trip with Napolin Vespa Tours. Naples seemed to be full of Vespas and I wanted to see the rest of Naples which I hadn't already seen, so a Vespa tour seemed perfect. Although it was sunny, it was freezing and I was so glad I was wearing long boots and leather gloves! 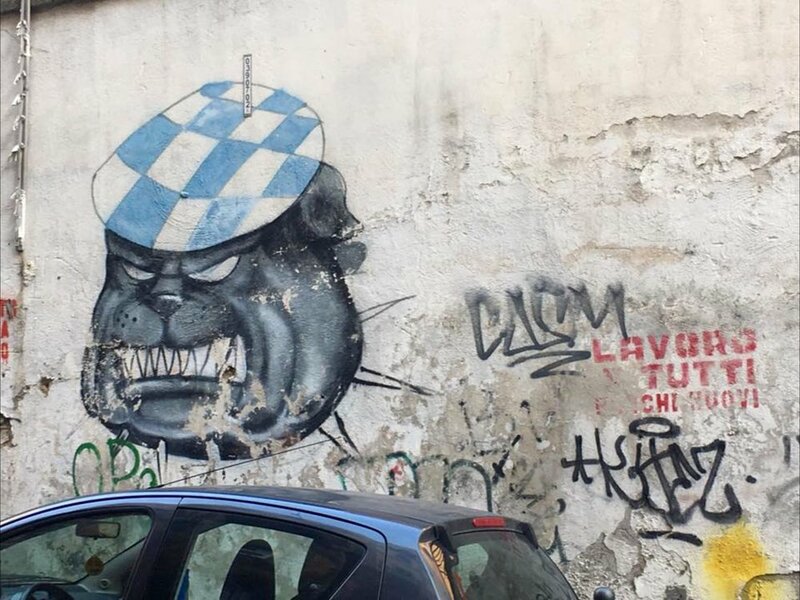 The best thing about this tour was although there was a set itinerary, when I told my guide I had already seen a couple of things on it, he was happy to improvise and add things I was interested in such as graffiti. 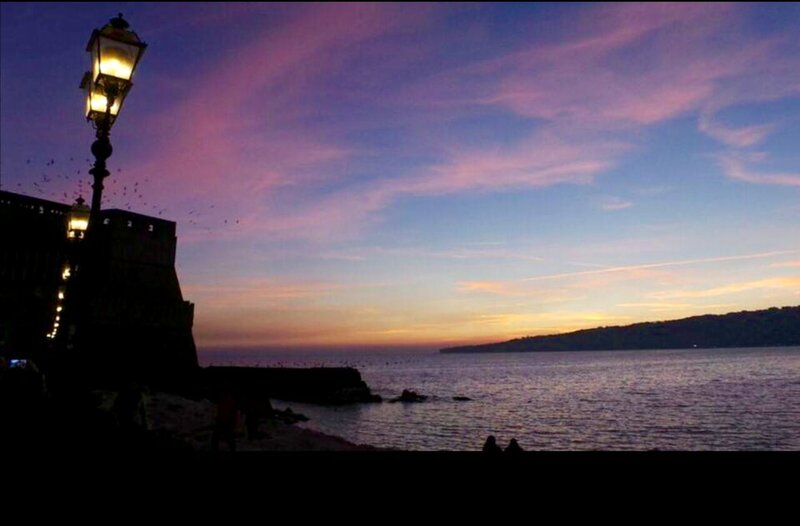 My favorite thing was the top of Posillipo Hill where you get a wonderful view of the Bay of Naples, this view will seem familiar as it can be found in photographs and paintings. I really enjoyed my time in Naples and I cannot understand why when you research into the city online there are often bad reviews. Definitely take no notice of all the negativity and make your own decision when you visit. Hope you have a great time!